Janus – a time to look backward and forward. my leaders/enders project (Charlotte’s Baskets) and the Lincoln Quilt (8 out of 13 blocks completed). 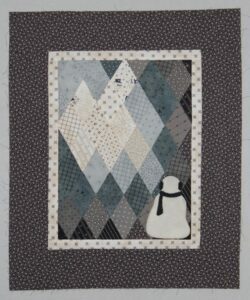 There were 11 finished quilts and 25 quilt tops sewn among which were 5 UFOs and 1 kit. I also discovered that I don’t care for hand quilting and like trapunto in small doses. 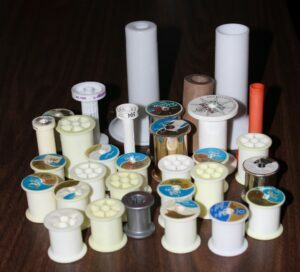 There were 31 spools of thread emptied with all the quilt tops and string blocks that were sewn this year. 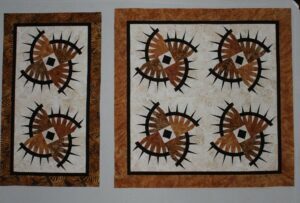 The Rocky Mountain Bear Claws wallhanging and table runner tops were completed. I am so happy to have them off of my design wall and be able to move on to something else. As for 2017 – the two biggest goals are to machine quilt 25 tops and (same as last year) do not add to the UFO project bins. Actually I have no idea how many UFOs I have mostly because I refuse to go through and count them. But as long as I continue to finish some up every year and do not add to the count, eventually there will be none. I want to get the Lincoln quilt top completed in 2017 and as soon as that is done I plan to make a crib sized Bible quilt. Other than those two tops, I am going where ever quilting inspirations takes me.